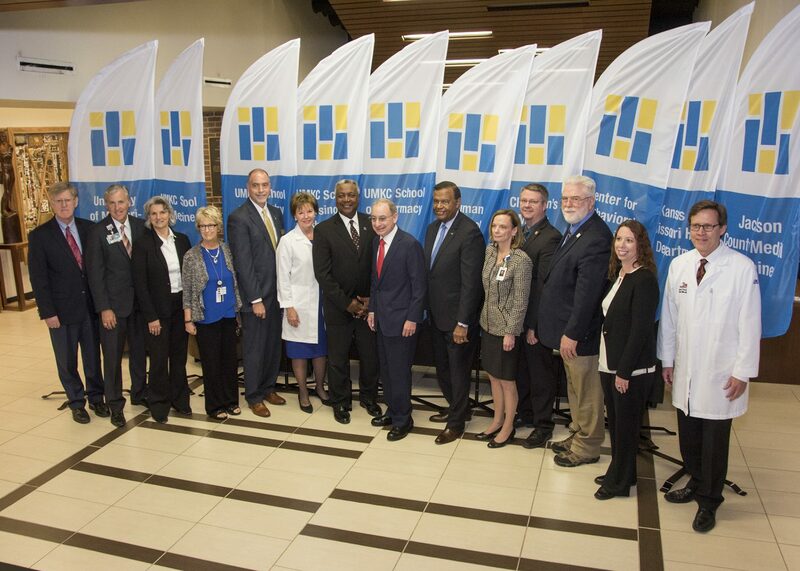 UMKC’s health sciences community and surrounding hospitals are part of a newly created UMKC Health Sciences District announced Friday, May 19. 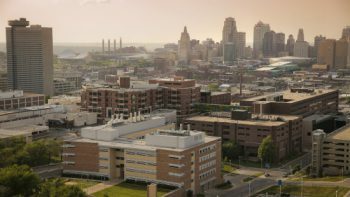 With a collaboration unlike any other in the nation, many of Kansas City’s leading health-care institutions announced today that they have agreed to align more closely to form the UMKC Health Sciences District. The newly created district combines the unique expertise and services of 10 partners to spur research and community outreach in service of the Kansas City region and beyond. The UMKC Health Sciences District is unlike any other in the nation. It is one of 18 areas in the country that have public schools of medicine, pharmacy, dentistry and nursing in one location along with a children’s hospital and an adult, acute-care hospital. But by including a health department, the medical examiner and a mental health center that bring together agencies of the city, county and state, the UMKC Health Sciences District is one of a kind. Drawing on these institutions’ efforts, the UMKC Health Sciences District has the potential to enhance collaboration on research and grant requests; combine efforts on community outreach; improve faculty recruitment; coordinate area parking, safety and transportation; and create shared opportunities in health and wellness for more than 16,000 health professionals, faculty members and students. “Better functioning health-care teams provide better patient care. Interprofessional education means educating future physicians, nurses, pharmacists, dentists and other health-care professionals to work effectively as members of those teams so that patients get the best and safest care possible,” said Steven L. Kanter, M.D., Dean of the UMKC School of Medicine. Kanter will serve as the first executive director of a newly-formed Health Sciences District Board. “The UMKC Health Sciences District is the perfect environment for students, scientists and health-care professionals to work and learn together as they deliver top-quality, personalized health care,” Kanter said. The UMKC Health Sciences District will be governed by a board composed of approximately 20 members, including two from each institution. The board will also appoint a chair for a two-year period beginning July 1, 2018. The chair will rotate among the following participants in the following order: UMKC, TMC and CMH. The first chair, who will serve a two-year term, will be the UMKC Chancellor. The executive director of the District will serve a three-year term. The District is about two miles in circumference and will be bound on the north by 20th Street; south by 25th Street; west by Oak Street; and east by U.S. 71 South.